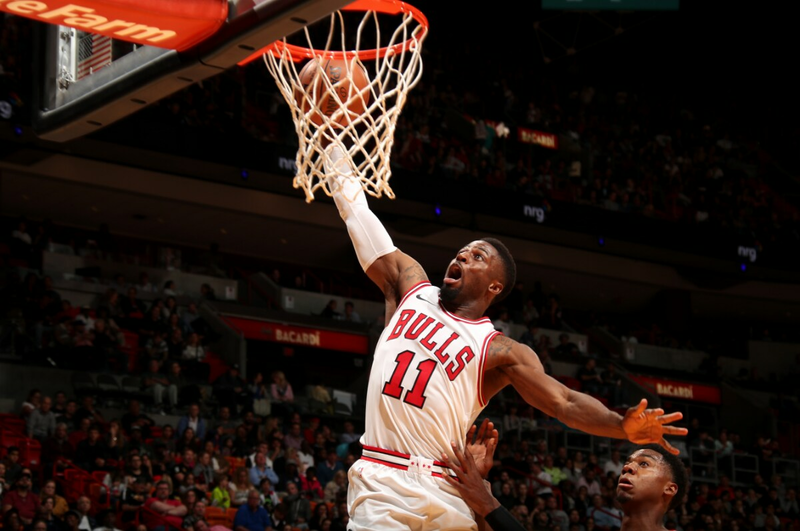 Was that a Big Two we saw Wednesday in the Bulls 97-91 loss to the Miami Heat? "Lauri (Markkanen with a career high 25 points), for him to step up and play the way he is now is such a great sign for the player he is already and the player he can become as he continues to mature and grow," said Bulls coach Fred Hoiberg. "The kid has no fear whatsoever. He's growing every game, he's a student of it. He wants to watch film, and he's a humble kid. He's got all the qualities to be a superstar in this league." And then there was Kris Dunn, who rallied the Bulls from a 15-point deficit to tie the game late in the second quarter with perhaps the highlight play of the season, a crossover drive past Goran Dragic and dunk in the face of seven footer Kelly Olynyk. "I thought Kris was the key in getting us back into that game," Hoiberg noted. "Closed it to two at the half; Kris had a lot to do with that, defensively most of all, which was a great sign. And attacking the basket as well. I thought Kris overall had a very solid game." Dunn, who could be on his way to his first NBA start Friday in Orlando, finished with 11 points, seven rebounds, five assists and two blocks, though also five turnovers. But in falling to 1-5, the Bulls perhaps offered a preview late in the Miami loss with a barrage of three pointers after an awkward two of 20 start shooting threes. Hoiberg went with a guard heavy lineup of Dunn with Jerian Grant and Justin Holiday, Markkanen, and Robin Lopez, the latter who had 22 points in yet another professional effort. The Bulls are by far the lowest scoring and poorest shooting team in the NBA. Again, they got off to a horrific start, trailing 20-6 eight minutes into the game with Grant again starting at point guard and this time David Nwaba replacing Paul Zipser at small forward. Zipser has been almost invisible much of this season, sometimes ailing, but also ineffective. He was scoreless Wednesday in 15 minutes and now is averaging 4.8 points and shooting 32 percent. Hoiberg started David Nwaba for Zipser, which was understanable given Nwaba's aggrressive driving play. And on one sequence, Nwaba rebounded and went 94 feet and dunked. But Nwaba had just four points in 29 minutes. He cannot make plays off the dribble with the ball and often goes long stretches without touching the ball. His defensive rebounding is ferocious as he had a team best 10. But he's probably too offensively challenged to remain with a starting group that has difficulty scoring. OK, most of the Bulls groups have difficutly scoring. "The effort was there; missed a lot of shots. It's going to happen, but if we play like that with that type of intensity, effort, win the battle of the boards, it's something we can build on." Which is why Hoiberg may have found something that works late with Dunn at point guard, Grant at shooting guard and Holiday at small forward. "Jerian off the ball can knock down shots," Hoiberg noted. "Justin had a lot of great looks (three of 15 overall) any day of the week (he makes); he hit a couple late and with Lauri out there you have three guys who can make shots, three who can put the ball on the floor and make plays with Lauri, Kris and Jerian." It may be time with the offense so anemic to make that move with Dunn now getting through a second game after his finger injury. Grant has tried to play the point guard role, and he had eight assists Wednesday. But it's gotten his game flummoxed since he isn't a natural point guard. He had one point until two late threes with two minutes left and the Bulls trailing by 14.
Credit Grant for trying to do what the team asked. But you can see him almost thinking how to pass instead of doing what he does best, which is shoot and score. Dunn had a rough start in his debut Saturday against Oklahoma City. He played better in the second half, though no one much played well at all, as Hoiberg remembers it. Dunn was ready in Miami, exploding into the game with aggresisve defense, two early blocks, one a chase down. And then driving for a three-point play and that stunning dunk. "I think the second unit, we came in and did a good job," said Dunn. "We tried to get stops, we just tried to pick up the pace. Tried to make the pace a little faster. Tried to play our game." The Bulls trailed 27-17 after the first quarter. But Dunn late in that first showed some stuff with a nice pick and roll lob pass for a Cristiano Felicio score. Dunn's the only one who's been able to get Felicio to roll on that play. That followed a smooth Dunn mid range jumper. His mid range shot, at least, doesn't appear broken. The Heat went ahead 35-20 early in the second quarter, and then it was Dunn who roused the team with those five straight points and an assist to Markkanen for a three. That sequence seemed finally to rouse the Bulls from their lethargy as Dunn handed the baton to Grant and the Bulls finished a 27-12 run to tie the game. They trailed 49-47 at halftime. "I thought we competed tonight," said Hoiberg. "Out of the gate we were a big sluggish; picked up our defensive intensity and that got us out on the break. I thought our pace was as good as it's been all year in the second quarter (led by Dunn). The effort was there; missed a lot of shots. It's going to happen, but if we play like that with that type of intensity, effort, win the battle of the boards, it's something we can build on." The Bulls actually had a chance to crack open the game in their favor taking a 61-55 lead halfway through the second quarter. But Markkanan and Dunn couldn't quite finish at the basket. Then Holiday, who is thin and does get bounced around inside, also missed point blank, all during another Miami dry spell. Given that break, the Heat rolled over and burned the other side with a 10-1 run to close the third quarter for a 67-64 lead. Then Tyler Johnson made a pair of quick threes for a 10-point lead and the Bulls never could recover. "Didn't get the job done tonight," said Markkanen. "Got another shot on Friday, so looking forward to that. I think we had a lot of open looks at the end, but we didn't make shots as well as we normally do. But we competed well. We're going to get better from it." The Bulls were seven of 28 on threes. But they made four of those in the last two minutes. They were three of 23 the first 46 minutes on threes. "I thought we got good looks tonight," said Hoiberg. "Last game we missed 17 wide open threes, had 27 overall. Those shots are going to fall." 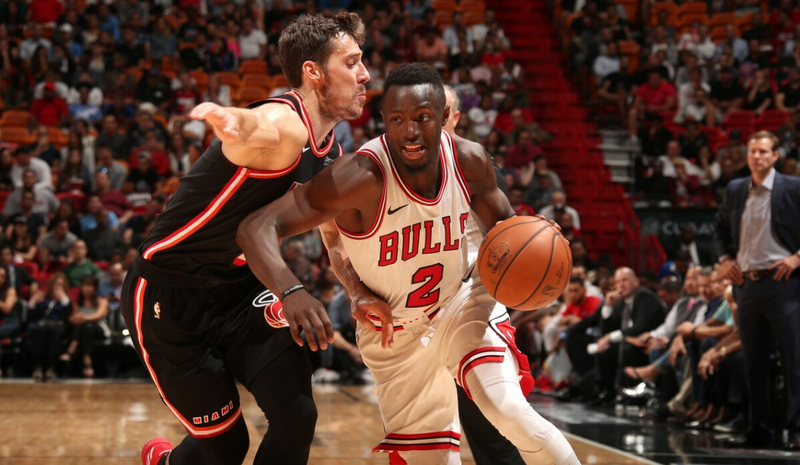 They were in the preseason, but with Zipser having gone missing and Grant trying to remember where everyone is standing, the Bulls offense, their weak link, has been dormant to start games and leaving the Bulls fighting back too often with too few options. One clearly has been Markkanen, who continues to really amaze at this point more than impress, a 20-year-old only modestly regarded who has emerged as the team's obvious go to guy. But much more than just making shots. Markkanen began to unveil a luggage set of moves and methods. He made a running floater, finished on a high/low by sealing his man, called for the ball in the post getting mismatches on pick and roll plays and dunked two handed rolling to the rim. "I thought our guys did a good job looking for Lauri," said Hoiberg. "They did not leave him too much. It was great to see him take advantage of some opportunities with mismatches in the post. That can certainly open our offense." It's still locked. And Hoiberg continues to search for a key.